Many people like to backup their BD/DVD collection to ISO image files to save physical space and prevent hard disks from damages. The created ISO image file cane be played on VLC Media Player, KMPlayer, SMPlayer. But as a data reflection of DVD or Blu-ray disc, ISO files cannot be directly opened or watched on Panasonic TV. What if you really want to watch ISO files on Panasonic TV? Is there an easy way to enable Panasonic TVs read ISO files from NAS? Find an all-in-one solution from the following paragraphs. Support Windows (10, 8.1, 8, 7, XP, etc), Mac OS X 10.11 El Capitan, Mac OS X 10.10 Yosemite, 10.9 Mavericks, 10.8 Mountain Lion, 10.7 Lion, 10.6 Snow Leopard, 10.5 Leopard. How to Convert ISO to Panasonic TV and NAS? Run the ISO to Panasonic TV Converter tool on your computer. Then click “IFO/ISO” icon to load your ISO image files. 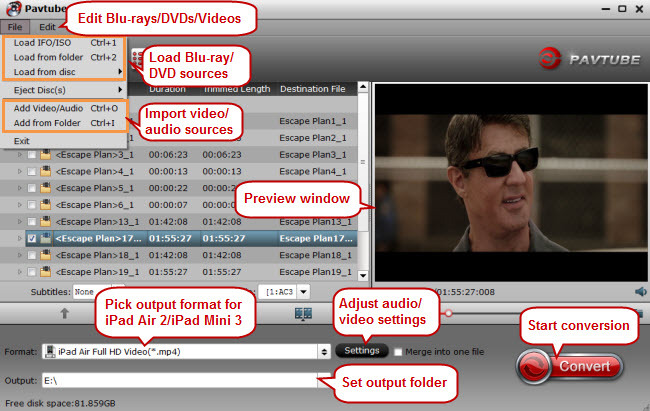 As you see, you can directly load Blu-ray and DVD discs. 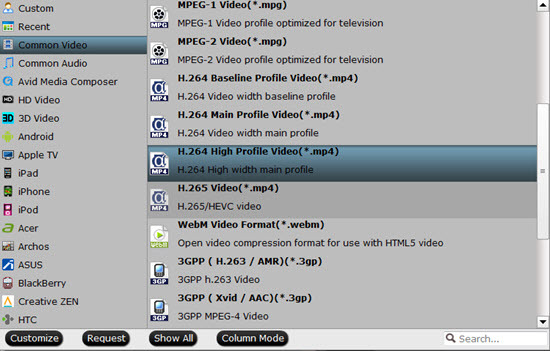 Click “Format” bar, and select .mp4 from “Common video” or “HD video” to fit Panasonic TV. Or select the format from “TVS”. After all necessary settings, hit the “start covnersion” button, this video converter will start to convert BD/DVD ISO to .mp4 for playback on Panasonic TV in no time. After the conversion is over, transfer the files to NAS then plug the drive in the Panasonic TV. Enjoy. How to set up a 3D TV for 3D viewing? ← Previous Previous post: How to Play 4K H.265 on Samsung JS300 4K TV?